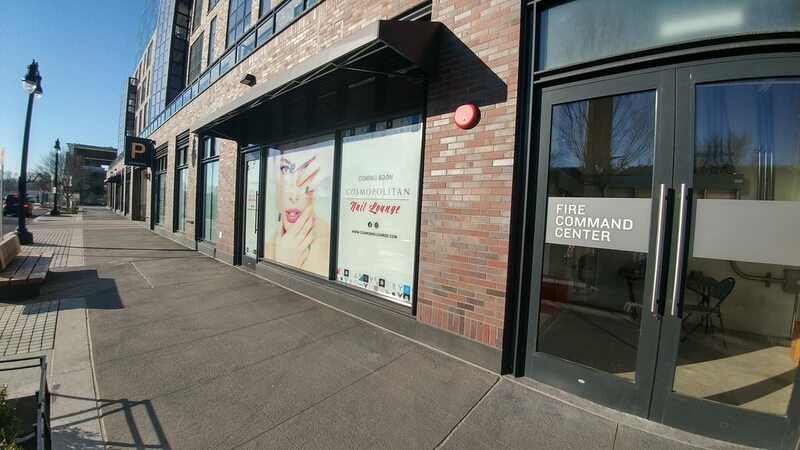 The men got their grooming news already this week, and now it's a tidbit for the ladies: Forest City has announced today that Cosmopolitan Nail Lounge will be opening in the ground floor of the Arris apartment building at the Yards, in one of the 4th Street retail spaces. It will offer full-service nail and waxing treatments, with free WiFi, refreshments, and "individual guest tables to listen to music or watch a movie during appointments." The new nail salon will join Arris's already-open Philz Coffee and previously-announced-as-coming-in-2017 tenants Conte's Bike Shop and the Juice Laundry. Anyone live above a nail salon want to chime in on the experience? Hopefully they have proper ventilation and this won't be an issue. I'm going to be quite annoyed if I wind up having to move because the chemical smell becomes unbearable. If it's anything like our experience with Philz opening shortly after we moved in, we had to change apartments, unfortunately. They tried a lot of solutions and maybe they have the building figured out by now (or your side is vented differently) but we ended up giving up. Everyone else is going to be so pretty in this neighborhood I will no longer fit in. I have been telling my husband for a while now that Navy Yard needs a nail salon, so I am very excited about this news! I can't comment on how it will affect residents at Arris, but this Capital Quarter resident is so happy! CSX UPDATE!!! I saw a double-stacked train this morning during my run. I know people like to complain about the construction impacts of the VA Ave tunnel but I appreciate hundreds of trucks taken off the road, with the reduced congestion, reduced emissions, and reduced cancer-causing diesel particulates. Yep, there are pluses and minuses to all big projects, and I agree with 202 that these benefits of the tunnel expansion don't get mentioned enough. My hope is that CSX continues to mitigate against the inconveniences from the construction to the extent possible, does a high quality job to ensure that we don't have any accidents/derailments there, and makes good on their promise not to bring any hazmat materials through the tunnel (no one cares so much about diesel particulates if there's a spill!). Residence Inn has rates loaded on the Marriott website. Looks like the first date you can book is April 26. I don't know if anyone will see this, but does anyone know why there were roughly six traffic control officers at the intersection of New Jersey and M this morning at 9:30am? The lights were working, and everything else seemed as usual. It was very strange. Maybe they were in training? I am sorry to read about the shooting. That is very unfortunate. Did Whaley's close down? Was just walking the dog and noted a bunch of work going on inside and out and thought maybe they were closing up for the season or something. Then walked by the Water St side of the building and a truck out in front that had the glass doors labeled "Whaley's" loaded up on it. It'd be a shame if it did - I think the place has (had?) promise, and even if business hasn't been as busy as they hoped, I don't think they've been open long enough to justify throwing in the towel. The website is still up and it appears as though you can still reserve on Opentable, so hopefully they're just doing a little work. Whaley's is definitely still open. I have always worried about them a bit though. I rarely see them fully booked, even though Morini always seems to be hopping. Whaley's sent me an email yesterday about Restaurant Week next week and Valentine's Day so it would seem they are still open. Good to hear, must be they were just doing some redecorating! They also made the top 20 restaurants in DC I believe in the Washontonian issue. Never been. It has been reported on another blog that a new residential development is planned for lower Barrack's Row. @202_cyclist: Where on lower Barrack's Row? 816 - 820 Potomac Ave, SE. I don't want to provide more info in case JD is planning on writing a post about this proposed development. They've been planning that for a number of years, so I've kind of been waiting until something was more solid. But I am not going to have time for many posts in the coming days, so feel free to chat about it. Here is the Urban Turf post about the lower Barrack's Row development. Just as an update (for those who may not have seen me RT'ing his links to his blog posts), we found out last Wednesday that Mr. JDLand had a bone metastasis in his left femur that had already caused a stress fracture and had left the bone weakened to the point where it was in danger of fracturing completely at any point. So on Friday morning he had surgery to implant a titanium rod the length of the femur. Surgery went well, he came home Saturday, but my time is of course being spent attending to him until the post-op pain subsides and his leg strength starts to come back. We are thinking of you and Mr. JDLand. Doing a walkabout this afternoon. Wanted to report that the fence on the empty parcel at 1st K&L has been taken down. Still an eyesore. I also submitted a 311 to ddot Because at the intersection of 1st and there was no stop sign for eastbound traffic. In a 10-minute span I probably saw close to five cars fly through the intersection almost striking other cars. @JDC--- Please also notify Rep. Chaffetz's office, who seems so concerned in how the 680,000 DC residents run our city. I don't remember voting for him for City Council or mayor. "We need to call Chaffetz every single day. Every day. Ask to speak to him. When the receptionist refuses, ask for his staffer for constituent services. Tell that staffer that you did not elect Chaffetz and you want him to get out of DC's business and focus on his own district's problems. Then call back and complain about every single issue in DC. Pothole - why hasn't he fixed it? Dog poop in trash cans - why hasn't he ordered locking trash cans? Missing dog - why hasn't he found it. And where was he at last night's ANC meeting?!?!?! Seriously - call him and ask to speak to him. Every day." Can someone find out and post his home address? @JD, Is the recent issued building permits tracker possibly broken or have there really been no permits of any time issued over the last month+? Not sure if you have to update your RSS link with the new year or if it's just been completely dead permit wise. They're moving to a new server, I was told a couple of weeks ago, so the feed isn't currently working. I'm asking for an update now. Gotcha. Are you able to share the exact query you use once you get it back up and running? I know the treaty agreement that placed the iron curtain down S. Capitol St places SW Waterfront/Buzzard Point purely in SWTLQTC territory; but, I'd love to be able to pull data on permits issued there as well. So many projects planned, yet it's so much harder to get a sense of what is actually where in the development lifecycle. Chain-link fencing is going up around the perimeter of Monument Valley. Looks like they are also beginning to take down that awful plywood wall. Is this close to starting? BLT, looks like the shoring/sheeting permit for Monument Valley could have recently been approved, or is at least very close. I'd also keep an eye at the NAB site at South Cap & M--those below-grade permits look pretty close as well. Unfortunately, there was a disturbing assault in front of the parking garage at 70 I St, SE. Neighbors-- be careful out there. @jdc...I think another issue was the placement of the Loading Dock. They wanted it on L St but there was a lot of resistance to that given L St between 1st and Half is a complete cluster during the week. I think DDot got involved...not sure where it stands. So, that could be adding to the delay. In case anyone is curious. Looks like the nail salon is going to be on 4th right in the middle of the building, next to the residents gym. See to me L makes the most sense because you already have loading docks on that section of the street, so no sense in putting something ugly like a loading dock on K, which has the potential to be a very nice block from Half to 1st. It looks like a port-a-potty was installed at the vacant 1st and K St SE lot. As someone said, this is a telltale sign that s--t is about to go down.